One day at school, I was browsing the bulletin board saw a tiny ad for ‘Compute-A-Date’. The word ‘Compute’ caught my eye. I was curious enough to take down the phone number. Why not? I thought. In China back then, we didn't have any services for men and women to meet. In fact, any such services would be considered dirty and evil, and would be shut down quickly. I called the number and a woman named Sharleen answered. She asked me a few basic questions, and then explained how the service worked. I would set up a time with her to go for an interview with her, for her to gain an understanding of my background, my personality and mannerism, and what type of people I was looking to meet. She then manually pair customers up. The word Compute in her service’s name had nothing to do with computers. I figured it was no harm to check it out. Each active member would record a self-introduction audio to be placed on their file. Every month, each member would receive a list of 5 names and their occupations. No other information would be given. The clients would dial into the audio recording of the 5 people to get a basic feel if you wanted to contact the person. Although the way Sharleen paired clients was crude and primitive, this being before the internet age and all, now looking back, I think it was an early and manual form of creating algorithms, the fabrics of our society today. Each month, Sharleen would learn a little more about each client by learning about their behaviors. Clients would let Sharleen know whom on their list they contacted, and what the outcomes were. This would give Sharleen some more insights to each client which would help her refine the pairings in the following month. The longer the client was with the service, the more insights Sharleen accumulated about the client, which afforded Sharleen more educated pairings. When I met Sharleen to do the interview, I really liked her. She was down-to-earth yet super sharp. After she asked the routine questions, we kept talking as two friends. I told her about my prosthetic leg and asked for her opinion if I should bring it up when I first made contact with people. Here again I felt the cultural influence and Dad’s way of raising me. I thought I should give people my ‘bad’ attributes when I talked to people, so they could make an informed decision as to whether to meet me. Sharleen told me it was a no no. Not unlike what happened when Professor Tracie taught me how to write an effective resume, Sharleen said the first phone call was to ‘sell’ yourself so that there would be a follow up. I felt uncomfortable doing that, as though I was giving people false pretenses. Sharleen said to at least try at the first month to see how it worked. That sounded good to me. I signed up for the service, and I recorded my self-introduction audio. For the first two months, I met some people but nothing came out of it. In the third month, I met Joe, an aerospace engineer who worked in the naval base in town. Joe was East European descent. He was shy, mild mannered, clean cut, intelligent, and cute. We got along very well. We had a lot of commonalities. We were compatible in many ways. We shared interests in classical literatures, indie movies, and music. I loved his parents. They were immigrants from eastern Europe. His dad is a handiman and his mom is a homemaker. They treated me with utmost affection, respect, and parentally love. I even joked with Joe once, that if we ever broke up, I would not be able to break up with his parents. Joe was the type of guy that all Chinese parents wanted their daughters to marry. Good education, good career, good hearted, and, a solid family man. A Chinese daughter would make her parents proud with a husband like Joe. In fact, I felt Joe was more similar to traditional Chinese men that to Americans. We were engaged 5 months after we met. I loved everything about Joe, both as a person and as a potential husband. I had an inkling that life with Joe would be very peaceful, safe, and worry free. He probably would never be unfaithful to his wife. He would always take care of his family. He would be a great dad to his children. I just had this faint nagging sense that something was a little off. I wondered if I was marrying him because he was a safe choice. Almost like he was too ‘good’ or something. But I brushed the thought aside. Joe would be everything I could hope for in a husband. The number one thing is that Joe had such a kind heart. I believed the rest would fall into places in time. Joe was extremely organized. Routines were very important to him. He maintained a daily routine of getting up at certain time, leaving for work at certain time, packing same lunch everyday of a PB&J and a piece of fresh fruit, with a multivitamin capsule. We went out for dinner every Friday evening, to the same Chinese restaurant, ordering our usual every time. My jaw dropped when Joe asked me to list out ten countries that I’d like to visit in our next ten annual vocations. The first one would be for our honeymoon of course. I joked that sometimes a little spontaneity might be good. Joe said with a wink, that he could be spontaneous, as long as he knew he had a firm plan in place. Plans like that gave him peace of mind and made him comfortable, he explained. Looking back, I wonder if Joe didn’t Asperger Syndrome. We now know that many autistic people never got diagnosed. Joe introduced me to many things that I didn’t even know were possible. Joe took me to fly an airplane! He got into aerospace engineering out of his love for the sky and his fascination with aircrafts. He said he knew exactly what he wanted to be when he grew up. One weekend Joe said he had planned a surprise for me. He took me to a small airport which parked helicopters. He told me I was going to learn how to fly! I was speechless. He explained that I would get on a helicopter with the pilot. The helicopter had two sets of controls, one for the pilot, and one for me. After the pilot took off and flew the helicopter above certain altitude, he would let me maneuver and fly the helicopter with the set of controls on my side! Of course he would take over if there was any tiny bit sign of trouble. It was definitely one of the most exciting experiences I had had. I shrieked and screamed with delight after we landed. I couldn’t tell Joe fast enough how good a time I had. That made him very happy. We also flew a glider and rode a hot air balloon. Joe also loved photography. He owned a professional grade of camera. He took beautiful photos of us. I sent the photos to Mom and Dad, and told them about Joe. Dad told me later that Mom cried when she read my letter and saw the photos. 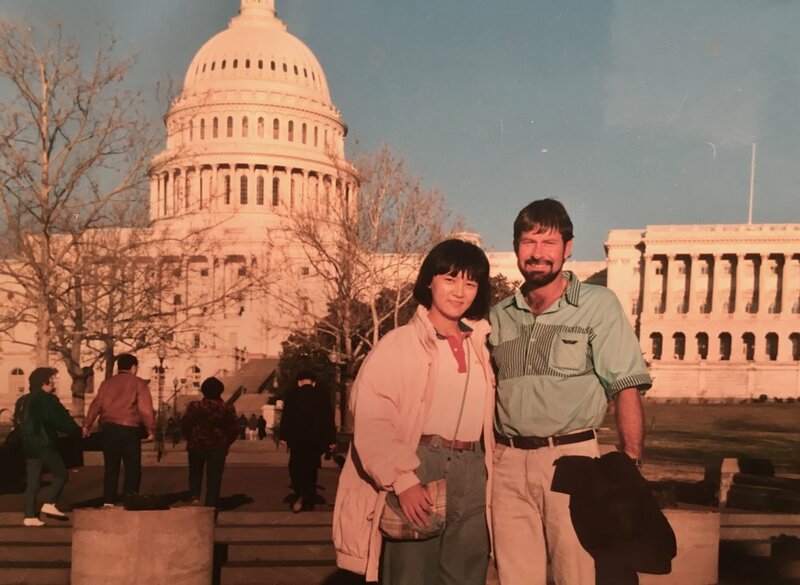 Her biggest worry since the accident was whether I could find a decent husband, who would love me for who I am, instead of using marrying me as a bargaining chip in exchange for my education, income, or living in Beijing or living in America. Now, she felt she could finally rest assured I would have a good husband. For the second summer of school, Mead Corporation offered me another internship. The job was in Atlanta. I packed up and drove to Atlanta from Dayton, in my 10-year old Mustang, my first car. I bought the car a couple of months before the summer, using the money I saved from my first internship. The car’s radio was broken, air conditioning did not work, and the side mirror on the passenger side was missing. But I was happy as I could be driving 10 hours straight. That was when I felt truly equal with everyone else in the country, as I no longer had to rely on others to navigate life. The company rented an apartment for me in a huge apartment complex right in the center of the city. I lived on the third floor. The stairs were outside in the open, so I would pass some apartment units on the first and second floor. On my way up the stairs, I noticed a plague inside of the window of one unit on the second floor. The plague leaned on the window sill facing outside. The plague read: “Alan, single and looking". I couldn't help but smiling at the sign. I thought the guy living there either was romantic, or had a good sense of humor, or both. About a month into my internship, one day when I pulled into the apartment parking lot after work, smoke started coming out from under my car's hood. I managed to open the hood, but did not have a clue what I was looking at. I was in a daze when I heard a nice deep voice: "Are you stuck?" I looked up and thought I saw the Marlboro man. He was tall, dark, and handsome. I said: "Yes I think I need some help." He showed me a water jug in his hand. He told me the smoke was due to lack of water in the tank, and filled it with the water jug. I was curious how come he had a filled water jug at this right time and right place. He told me that he saw me and my smoking car from his balcony. That was how I met Alan. I thought the name Alan sounded familiar but didn't thinking about it too much. Later Alan asked me if I had seen the sign he put on his window. I suddenly realized he was that Alan. I said yes I saw the sign and thought it was so cute. I met a laidback ‘redneck’ while interning in Atlanta, Georgia. Alan told me he had seen me coming and going and thought I was cute. He asked a friend to make the wood plaque to try to catch my attention. I thought that was one of the most romantic stories I had heard. I showed Alan my engagement ring, and told him about Joe. I told him I would be in Atlanta for just three months for an internship job. Alan said it was just the story of his life and wished Joe and me all the best. Alan offered to show me around town. It was my first time in a Southern city. We went to Civil War historical sites, the birthplace of Margaret Mitchell, author of Gone With the Wind, Stone Mountain, Coca-Cola Museum, CNN Studio, and many other places that make Atlanta the city it is. Joe and I talked on the phone two or three times a week. At one of the calls, I told Joe about Alan and friends a made at work. Joe was glad I had made friends. I did not know why I neglected to mention to Joe the ‘single and looking’ plaque. I figured I'd go back to Dayton in the fall and Alan would be just a memory. A couple of days after I told Joe about Alan, Joe called and said he was taking a few days off from work and he was coming to Atlanta to visit. It felt so sudden at first, but after we talked some more, I agreed it would be really good. Three months was a long time to not see each other, and Joe had never been to Atlanta before. I picked up Joe from the airport. Alan was different from anyone I had known before. He grew up on a farm, did not go to college, and was an exterminator (pest control, not in same trade as Arnold Schwarzenegger). He worked for himself. He was funny, sincere, rugged, and unpretentious. He was not 'stuffy' like people in my 'circles' could be sometimes. He was such a contrast to Joe and like a breath of fresh air to me. Since I was engaged to Joe, Alan and I didn't worry too much about getting too close. We had a lot of fun together, like two buddies. My internship quickly coming to an end. One day, Alan told me he was having these feeling for me. I found myself sharing those feelings. So the friendship turned into an affair. I felt a little bad to Joe but didn't tell him. I told myself that it was just a summer fling. Joe and I would be married soon, and what he didn't know couldn't hurt him. Before I left Atlanta, Alan and I agreed to not keep in touch. We felt things would be easier that way. In early fall, I went back to Dayton and to Joe. I was glad to go back to my routines, and my 'orderly' life. But I was caught off guard how much I missed Alan. I secretly hoping he would call. When he did, he said the day I left, the company's people moved my furnitures away while he looked from his balcony. He said it was tough. Long story short, like so many before and so many in the future, I decided to break my engagement to Joe. It'd be better than dragging him along, I thought. That was the right thing to do. On the rational level, my upbringing said to marry Joe, who held a solid career in aerospace engineering, was more cultured and better traveled, and was a rule following citizen. I had a lot of commonality with Joe. Joe was the kind of men that I growing up believing I should marry. But In the end, I followed my heart. When I told Mom and Dad that I broke my engagement to Joe, and told them about Alan. They thought I had gone mad. They had said many times that Joe would be a perfect husband and perfect son-in-law, so I knew the news would not be received calmly. But the real reaction, especially mom's, was far more serious than I had expected. Mom told me she and Dad were coming to America to stop me from making a big 'mistake'. Mom said with Joe, she would have peace of mind that I was taken care of, which had been her biggest worry over the years. With Alan, Mom said, she would continue to worry for me and never have peace of mind. Mom and Dad asked me what was wrong with Joe. I told Mom and Dad that nothing was wrong with Joe. As a matter of fact, Joe would be 'a ‘perfect’ husband. But somehow, I told my parents, Joe was too 'proper' for me. This made Dad furious. What are you talking about! Being proper is a bad thing how? He asked. I really couldn't answer it. I had a hard time to put it into words, as I had a hard time understanding it myself. Perhaps I was so used to having a turbulent life, the prospect of a peaceful and uneventful life scared me? Deep down, maybe I was afraid to be bored eventually? I didn’t know. I just knew I could not marry Joe. It was just a feel. To me, Alan is laidback, Joe plans carefully for future. Alan is street smart, quick in dealing with any situations. Joe is book smart, 'unhandy'. Alan is rugged and Joe is polished. I grew up among book smart people. Alan’s street smarts were very appealing to me. After I finished graduate school, I moved to Atlanta to marry Alan. Alan and I got married in the Atlanta City Hall. My parents were in China. Alan mom decided not to come to witness the wedding. Alan’s mother was a contrast to Joe's parents. Alan's dad had passed away a long time ago. His mother lived by herself in Blakely, where Alan was born. His mother refused to meet me, for I was Asian. She was born and raised in 'deep south', and spent her whole life there. There were very few interracial families. She wanted her son marry a nice white girl, who would bear perfect white grandchildren for her. I’ve never met my mother-in-law.